Learn more about RF Integration’s capabilities and track record in Infrastructure Applications? Wireless Infrastructure is evolving to support increased Voice, Data and Video applications on 3G and 4G Smart Phones. Increased data throughput from Wireless Backhaul is supported by 256 QAM systems and new Carrier Grade Ethernet links at E-band with 1Gbps data rates.LTE replaces the existing core with an All IP network, 20MHz channels and SC-FDMA schemes that supportdata rates up to 326.4Mbps.WiMAX and 802.11n enable data throughput up to 600Mbpsand robust local area coverage with 4x4 MIMO architectures and OFDM signals. High data rates with 100Mbps Downlinks and 50 Mbps Uplinks and a maximum 1Gbps downlink for LTE. All IP Backbone which supports multimedia applications and high Quality of Service. Low latencies (less than 5 msec) to meet LTE network requirements. Flexible Backhaul Connectivity for Point-to-Point, Point-to-Multipoint, Multipoint-to-Multipoint architectures. The increased bandwidth drives the applications toward higher and higher frequencies up to 86GHz with multiple wireless systems covering multiple data rates and range requirements. 4G/LTE Basestations require anywhere from 50–200 Mbps bandwidth in order to support a range of advanced services. In addition, the cells have to be moved closer together in a “micro-cellular” networking structure particularly in downtown urban-canyon environments. Base stations move from roof-tops to street level to achieve useable high data rate coverage. 4G Basestations will be more micro or pico-cell in nature with MIMO architectures and heavy use of parallel RF Channels and repeaters. 4G systems will provide a comprehensive and secure all-IP based solution where ultra-broadband (giga-bit speed) Internet access, IP telephony, gaming services and streamed multimedia are available to mobile users. RFICs and MMICs that balance performance, power consumption and cost will be required. WiMax offers up to to 1 Gbit/s fixed speeds for delivery of last mile wireless broadband access. The bandwidth and range of WiMAX make it suitable for portable mobile broadband connectivity and a wireless alternative to cable and DSL. It also serves as a wireless backhaul technology for 2G, 3G, and 4G networks. WiMax backhaul technology is designed to bring outdoor wireless last-mile broadband access as a 4G Mobile broadband technology. WiMax complements the 802.11 standards by tying together Wi-Fi networks and provides for seamless wireless backhaul for both fixed wireless and mobile wireless connections. As an outdoor wireless last-mile broadband connection in point to multipoint wireless networks it provides connectivity for Wi-Fi hot-spots (or hot-zones), cellular mobile backhaul and other connections without resorting to DSL, cable, or T-1 lines. Broad deployment of WiMax required high performance RFICs. High Capacity Microwave Backhaul using microwave wireless bridge systems operate in many parts of the radio spectrum. (UHF/VHF, 900MHz, 2GHz, 3.65GHz, 4.9GHz, 6GHz, 11GHz and 18GHz. Licensed microwave wireless Ethernet bridges can go distances up to 50+ miles and provide data rates up to a few hundred Mbps. Modulation schemes such as QPSK or 16, 32, 64, 128, 256 QAM provides symbol rates up to 50 Mbaud that continue to drive the last ounce of spectral efficiency out of relatively narrow channels making microwave backhaul a crucial element in current cellular backhaul networks. RFICs and MMICs with demanding performance support the increasing demands of Microwave backhaul. As the demand for mobile bandwidth continues to rise, traditional macro-cellular architectures will fail to deliver the needed network capacity – particularly in dense urban centers. Microcellular architectures, which allow for spectral re-use and higher overall network capacity offer a compelling solution. These in turn require high capacity wireless backhaul with capacities from 34 Mbit/s and 1 Gbit/s and latencies in the order of 1 ms. 60 GHz Wireless links provide solutions in short range systems over a few hundred yards before the signal rapidly deteriorates. The availability of large amounts of bandwidth at 60GHz support data rates to 1 Gbps. E-Band (71-76GHz and 81-86 GHz) offer ultra-high capacity point-to-point communications. E-Band offers Full-duplex Gigabit Ethernet connectivity at data rates of 1 Gbps and higher with carrier class performance at distances of a mile or more. 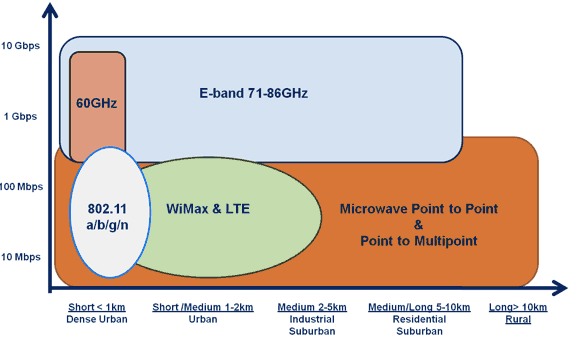 The 10 GHz of spectrum available at E-band represents by far the most ever allocated by the FCC at any one time. The E-band spectrum allocation is enough to transmit at 1 Gbps in BPSK format and up to 10 Gbps with higher order modulation. mmWave links demand a new range of RFICs, MMICs and high performance RF and Analog IP cores.